Have you seen the Land of Eden? No, it’s not in Mesopotamia. At least not William Byrd’s Eden. Byrd’s original Land of Eden was in North Carolina. William Byrd II was born in Virginia in 1674, likely near the present location of Richmond, a city he founded in the 1730s. Although he spent much of his early life in London, with relatively brief periods in Virginia, he returned permanently to his native land in 1726. In 1728, he participated as one of Virginia’s commissioners in the NC/VA boundary survey. It was during the latter part of this survey that Byrd purchased 20,000 acres south of the boundary line from the North Carolina commissioners. This wedge-shaped tract of land lies almost entirely within present day Rockingham County, NC. A very small sliver at the eastern edge of Byrd’s tract lies in present day Caswell County, NC. The eastern boundary is 1 mile in length, the western boundary 3 miles in length, and the tract covers 15 miles from east to west. In the early 20th Century, James Trogdon, a local surveyor, sent out a Christmas greeting card in the form of a blueprint of Byrd’s plat, with then present towns of Leaksville, Spray, and Draper superimposed. 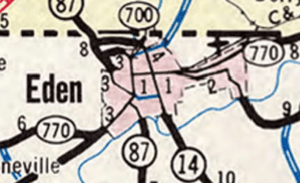 In 1967, the towns of Leaksville, Spray, and Draper merged to form the town of Eden, taking its name from that given to the region by William Byrd over 200 years earlier. Leaksville, Spray, and Draper on 1967 North Carolina Official Highway Map courtesy of State Archives. Eden on 1968 North Carolina Official Highway Map, courtesy of State Archives. The location of Eden was a moving target in Byrd’s lifetime. The 26,000 acres he owned in North Carolina were just a small part of Byrd’s vast land holdings. He had received a grant from the Virginia Council for 100,000 acres in southern Virginia near the confluence of the Dan and Staunton rivers, “on which to settle a number of Switzers and other foreign Protestants whom he speedily expected.”7. Byrd arranged for the publication of a book in Switzerland to encourage immigration to Virginia. (He had a deadline to meet for settling the 100,000 acres to avoid a hefty tax bill.) The book published by the Helvetische Societat, Neu-gefundenes Eden (New found Eden), was largely drawn from John Lawson’s A new voyage to Carolina (London, 1709) and Robert Beverley’s The history . . . of Virginia (London, 1705). It contained two maps, one credited to Edward Moseley that covered Pennsylvania through the Carolinas, and another depicting Byrd’s “Eden in Virginia”, shown below (full view available here). Margaret Beck Pritchard, Virginia Lascara Sites, William Byrd II and His Lost History: Engravings of the Americas. Preview available via Google Books. E-book available for less than $8. Johnston, David W., “Birds and Natural History Observations in the Life of William Byrd II of Westover”. From Banisteria, Number 5, 1995, © by the Virginia Natural History Society (http://virginianaturalhistorysociety.com/banisteria/pdf-files/ban5/Banisteria5_Johnston_William_Byrd%27s_observations.pdf). Accessed 19 Nov. 2017. Encyclopedia of North Carolina entry for the Land of Eden. Want to move to the Land of Eden? Here is a nice little home. William Byrd’s Natural History of Virginia; or, the newly discovered Eden, a 1940 English language translation of Neu-gefundenes Eden… If anyone finds a full text version on line, please let me know via the What’s on your mind? comment box below. In the meantime, check with your library. Copies are available to purchase on line via bookfinder. A b/w photographic reproduction of the original drawing by Byrd was published on page 41 of The Geographic Revolution in Early America... by Martin Brückner. I cannot consistently find the image on line. It seems to be intermittently included as part of a Google Books preview. The complicated history of ownership of Byrd’s “Land of Eden” in North Carolina is explained by Charles Rodenbough in History of a Dream Deferred. North Carolina Gazetteer, available on line. According to this 1962 map of Rockingham County, the total combined population of the three towns was less than 15,000. A contemporary account of the Switzers’ tragic voyage was published in the Virginia Gazette (Williamsburg) on January 19, 1738, and reproduced in the Lower Norfolk County Virginia Antiquary, Vol. 2 (1902), available on line here. This entry was posted in 18th Century, Boundaries and tagged dividing line, Eden, Edward Moseley, Leaksville, william byrd, William Mayo by crmaps. Bookmark the permalink.